UNIVERSITY OF EDINBURGH—Some of the world’s oldest cave paintings have revealed how ancient people had relatively advanced knowledge of astronomy. The artworks, at sites across Europe, are not simply depictions of wild animals, as was previously thought. Instead, the animal symbols represent star constellations in the night sky, and are used to represent dates and mark events such as comet strikes, analysis suggests. They reveal that, perhaps as far back as 40,000 years ago, humans kept track of time using knowledge of how the position of the stars slowly changes over thousands of years. The findings suggest that ancient people understood an effect caused by the gradual shift of Earth’s rotational axis. Discovery of this phenomenon, called precession of the equinoxes, was previously credited to the ancient Greeks. Around the time that Neanderthals became extinct, and perhaps before mankind settled in Western Europe, people could define dates to within 250 years, the study shows. The findings indicate that the astronomical insights of ancient people were far greater than previously believed. Their knowledge may have aided navigation of the open seas, with implications for our understanding of prehistoric human migration. Researchers from the Universities of Edinburgh and Kent studied details of Palaeolithic and Neolithic art featuring animal symbols at sites in Turkey, Spain, France and Germany. They found all the sites used the same method of date-keeping based on sophisticated astronomy, even though the art was separated in time by tens of thousands of years. Researchers clarified earlier findings from a study of stone carvings at one of these sites – Gobekli Tepe in modern-day Turkey – which is interpreted as a memorial to a devastating comet strike around 11,000 BC. This strike was thought to have initiated a mini ice-age known as the Younger Dryas period. They also decoded what is probably the best known ancient artwork – the Lascaux Shaft Scene in France. The work, which features a dying man and several animals, may commemorate another comet strike around 15,200 BC, researchers suggest. 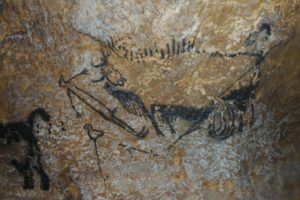 The team confirmed their findings by comparing the age of many examples of cave art – known from chemically dating the paints used – with the positions of stars in ancient times as predicted by sophisticated software. The world’s oldest sculpture, the Lion-Man of Hohlenstein-Stadel Cave, from 38,000 BC, was also found to conform to this ancient time-keeping system. This study was published in Athens Journal of History. Dr Martin Sweatman, of the University of Edinburgh’s School of Engineering, who led the study, said: “Early cave art shows that people had advanced knowledge of the night sky within the last ice age. Intellectually, they were hardly any different to us today. Become a Popular Archaeology premium subscriber.